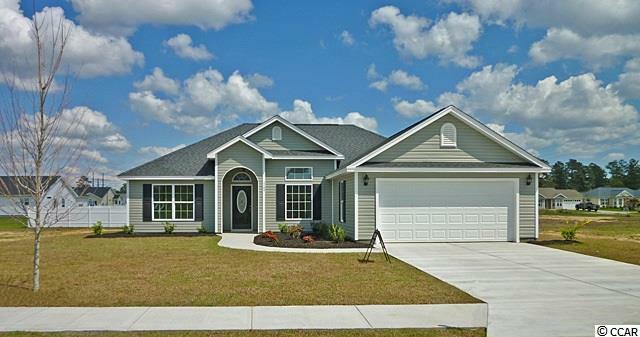 This is a most desirable Crusade model featuring 3 bedrooms, 2 full baths, vaulted family room ceiling, spacious open floor plan, true split bedroom plan, breakfast nook with bow window, tray ceiling in master bedroom and a spacious walk in closet, 2 car garage and a 14 x 10 back patio. It is located in the beautiful community of Yauhannah Landing featuring an exclusive community boat landing and spacious 1/2+ acre lots. It is boat and RV friendlly. Homeowners will need to park their boats and/or RVs on a prepared surface (preferrably concrete) in the back yard. Yauhanna Landing is surrounded by gorgeous trees and backs up to the Waccamaw National Wildlife Refuge. This beautiful, gated community is located approximately 16 miles from Conway, SC, approximately 25 miles from Georgetown, SC and approximately 45 minutes from the beach! It doesn't get any better than this so come on out to Yauhannah Landing and start living the life you have always dreamed of!